Distributors: Ingram, Amazon, Paloma Press, among others. 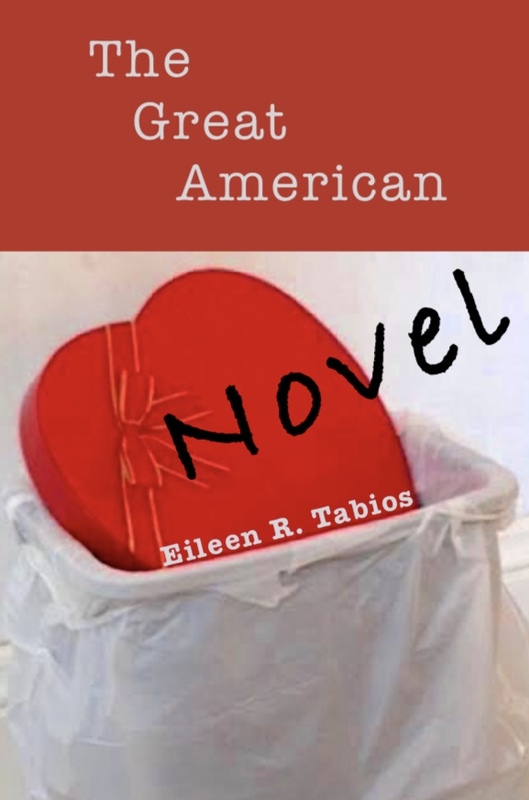 Paloma Press is pleased to release The Great American Novel (GAN) by Eileen R. Tabios. Spanning two decades, GAN presents a unique vision of visual poetry. Texts and images range over asemic writing caused by fallen white hairs and tree bark, science fiction created through shed claws from the poet’s cats, an unreadable book, a disruption of Walmart architecture, collages of randomly chosen stickers, open-ended drawings and sculptures, invented words and poetry forms, and disrupted text. Content also includes images from exhibitions not seen outside their venues in the Philippines, Malaysia, and Serbia. While classified as “visual poetry,” the works continue Ms. Tabios’ disquieting and multifaceted inquiries on the collision of English and colonialism. The book’s opening work, a sculpture-illustrated Artist Statement, is available through “Within the Filipino Diasporic Cloud” at Verity LA, March 12, 2019. With The Great American Novel: Selected Visual Poetry (2001-2019), Eileen Tabios not only presents 19 years of her forays into visual poetry, but takes the reader on an extremely personal journey of exploration of cultural identity, the ramifications of colonialism, the functions of language and the possibilities of connectivity in love and pain where each poem acts as a poignant marker along the way. Each sequence in this collection vastly differs—from asemic chance operations composed of Tabios’s plucked white hairs let fall into place (recalling how Duchamp composed 3 Standard Stoppages) to a description of each poem-object in a destroyed mail art correspondence of sculptural visual poems. Tabios’s openness to possibility has created poems radiating with life which are as heavy as they are celebratory. If you’re looking for bubblegum, move on—here is something entirely different for your eyes to chew on. “I write in Poetry…Poetry is its own language.” In the work of Eileen Tabios this sometimes means crossed-out lines, removal of substance to discover other, deeper, substance, thus unearthing the real in a sequence of forgotten things, abstractions, thoughts, people, moments . . . the recovery of each deliberately formed, reformed, performed. She lives the reality and potency of visual and textual poetry with equal fluency, melding the two, bringing us to them as she brings them to us. Eileen Tabios is a human miracle of confident courage who invents and embraces the most difficult questions in rapid succession, and indwells in what erupts from each, demanding everything of the self within an infinity of other selves. By her being and her work, Eileen reveals that artistry at its most potent is self-aware. She embraces the stuff of life that might be art, and she erases the divide between discovery and invention. Eileen Tabios takes part by taking apart then seaming beyond seeming. Commas as visuals take form, flight, shape. Real lines of once alive things plucked from hair inventing poetry without genuflection. Achromotricia re(de)fines asemia, emerging a new version of whiteness against cloth backdrops. Finding poetry as poetry is. Eileen asserts in natural form the joining of worlds by being knowing learning doing becoming fascinated by what creates itself around her as she fascinates us by what she makes herself. There is a close and multilayered connection between image and text in this book of Eileen Tabios’ selected visual poetry projects, from 2001 to the present. In some cases we have texts within the images, as well, and more than once they come from Tabios’ own verbal poetry. The images and their descriptions have a great influence on each other’s effect. I immediately got attracted to the first images, documenting an installation titled “Pilipinz Cloudygenous”. Then I read the notes, and went back to the images. The effect got stronger and stronger. While the mobiles of say, Fischli & Weiss, are about the funny chain of causality, Tabios’ work is about a funnily represented, rather absurd, but still functioning chain—leading back to the sources. “Hanging (from a ceiling)”, roots in the sky. In The Mortality Asemics series, I can see—and learn from the description: the two processes are always intertwined! —how eight strands of plucked out white hair transcend into a celestial constellation and, in a parallel fashion, into the “lines” of an asemic poem. In a similar sequence, titled The Outsider’s Dilemma, one hair falls apart from the others. It is doubly cut off from its source, and that is exactly why it, movingly, gets in the focus of the wordless poem. The title piece is a heart-shaped red chocolate box seeming to protest through its own theatrical presence against having been dropped into a waste bin. The heart is apparently too big to be fully hidden. The work dates from 2016. “Answers, as with the internet and diaspora, are not fixed but provided by its viewers based on their differing subjectivities.” See what you read and read what you see. Tabios’ wise and entertaining book reveals a multitude of contexts. Eileen R. Tabios is one of the more adventuresome and truly creative poets before the public today. She is absolutely able to write poems in the usual styles and make her works resonate with every reader. But she always is searching for ways to push the use of words into formats or situation that challenge the brain as well as heart. She makes us think: she makes us work. And she is able in this book to entertain. There are so many forms to Poetry, Autobiography. To Creativity. Ahh, so desu ka! I was relieved to hear this and assured myself that I, too, am creative…. And this is why Eileen’s projects are always an inspiration.…because a Poet chooses to see meaning in everything. So what’s novel about this novel? Novel as the “fictitious prose narrative of book length” and novel meaning “new, original, never before seen”. Pick up The Great American Novel and see for yourself. Take inspiration from the Poet to unleash your own limiting beliefs about creativity. Raise your vibrational energy. Heal a grieving heart; heal the world. 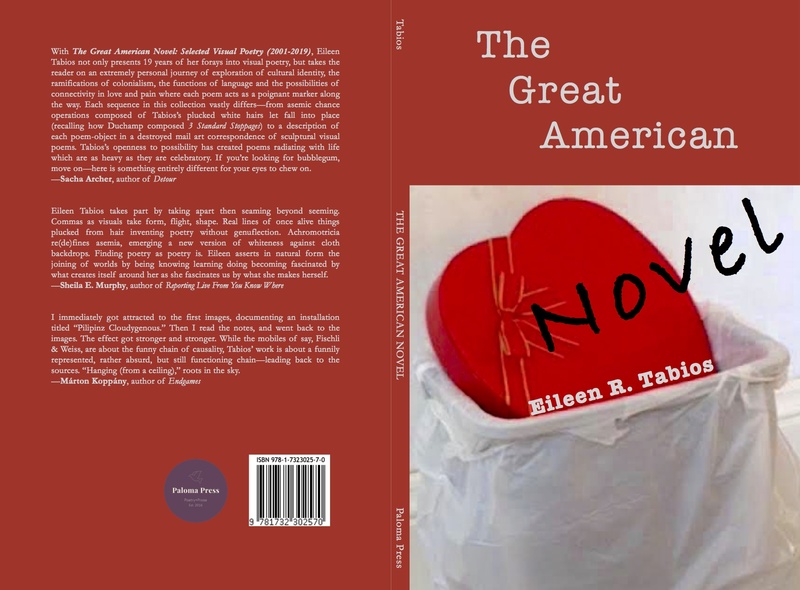 …said to be due for release on Valentine’s Day, appropriately enough, is California-based poet-editor-publisher Eileen Tabios’ The Great American Novel: Selected Visual Poetry (2001-2019), from Paloma Press. Not too sure if it’s a novel, given the subtitle, although one can expect the indefatigable author of novel forms to come up with yet another morphed mutant of a literary genre. …truly an astonishingly post-conceptual work of art, an impressive accomplishment! I am so delighted! It is an insight on how her mind works — her use of everday items as visual poems; the way she sees possibilty of poems in everything, is truly inspiring! I will always be grateful for her agreeing to be my first guest on my podcast without hesitation!